With chip on board LED technology for a powerful output and a sweeping 160° beam angle, the 15000-Lumen Warm White Video Dive Light from Bigblue is a compact, general-purpose light that's especially suited to underwater video. 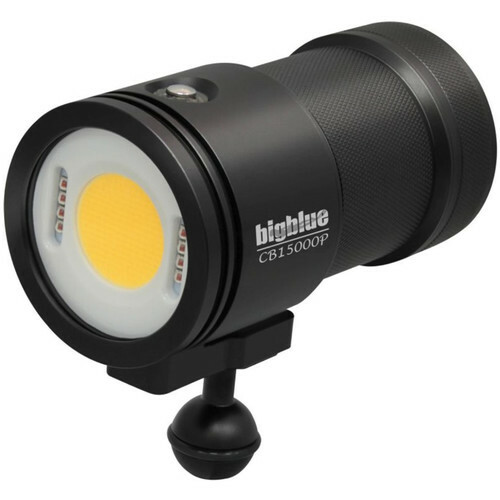 It offers four brightness levels of 5000K white light, plus a 1000-lumen red light setting generated by eight XPE LEDs for staging photos and observing light-shy sea creatures. The 5.2 x 2.8" light is powered by a rechargeable 8 x 21700 Li-ion battery pack, with runtimes from 1.5 to 15 hours, and its anodized aluminum housing is built to last.